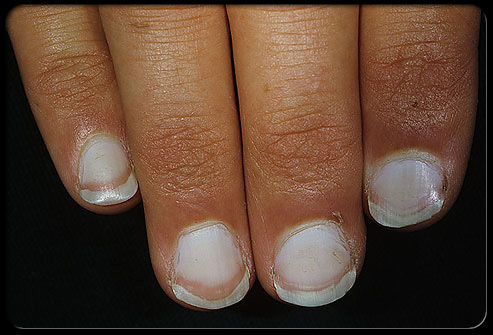 9 signs of health problems – what your nails are telling. Do you know a saying “an apple a day keep the doctor away”? Also you probably heard that self examination as part of prevention medicine helps a lot to see early signs of a health problems; and our nails could play crucial role in this. If you look carefully you can find a lot of interesting things some of which could indicate serious health problems. Small cracks, splitting and color changing of your nails, all of these factors have to be taken into immediate consideration. Do not wait too long and check in with your physician. 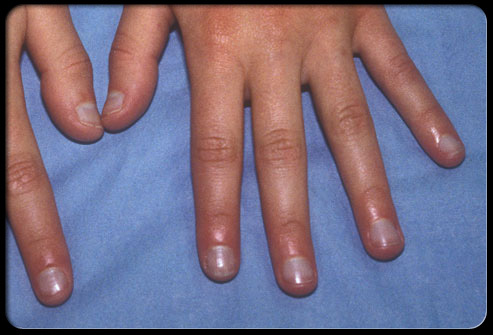 If you have white nail with dark nail lunule, visit the doctor and do a blood test for the hepatic ferments. Hepatologist can discover liver problems or, even hepatitis. Mostly yellow nails indicate various nail funguses. At the same time nail plate may become thicker and start to crumb, lunule and root of the nail change their form. Also yellow color signalizes about serious internal problems, like lung illness or psoriases, diabetes and issues with thyroid gland. 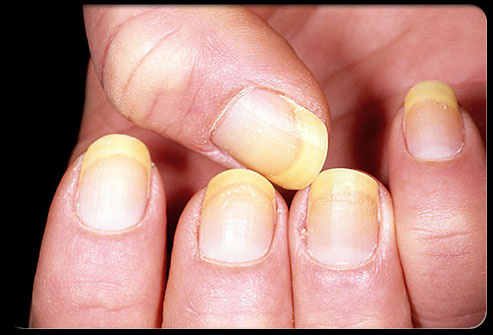 But if you tend to overuse red nail polish, your nail plate tend to became yellow as well. Blue color of the nails tells us, that our body is lack of oxygen. This happens due to pneumonia; also hardly seen blue cast can reveal diabetics. 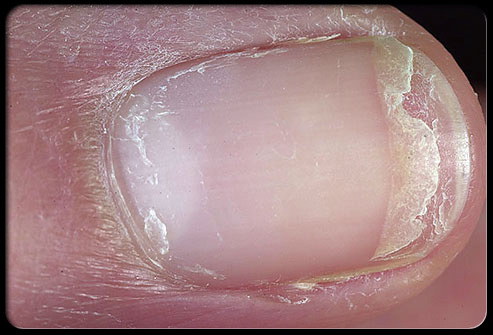 If surface of the nails is irregular with waves or small holes, this could be a early sign of psoriases, or joint deceases and arthritis. 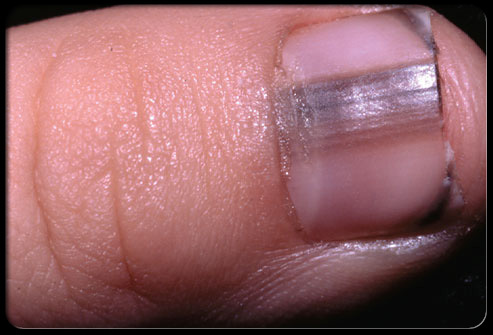 Furthermore, nail itself is transparent and skin beneath it has red brown color. 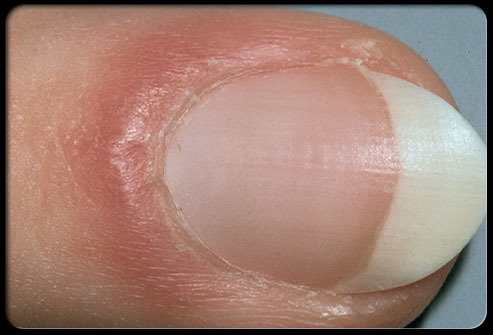 In 10% of cases first signs of psoriases becomes visible on nails. 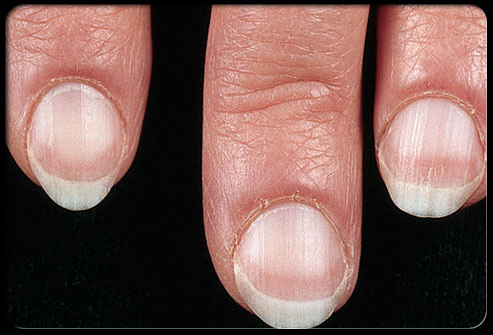 If you nails are dry and easy splitting, dermatologists recommend to check up your thyroid gland condition. Although constant splits and brittles within yellow color, tell about nail funguses. One of the reasons (non medical) is a wrong manicure tool, switch to a quality glass nail file that prevents splitting and brittleness. 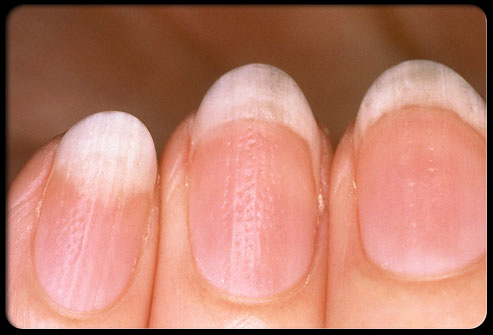 If you have dark lines appeared under nails surface immediately go see a doctor. Sometimes, the cause of these line is melanoma, one of the most dangerous types of cancer. 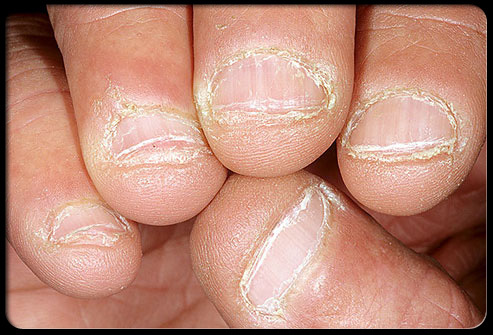 Terrible habit if nail biting appear among stressed and anxious people. People with obsessive-compulsive disorders, actually can’t drop this habit. That is why, if you can’t stop doing it, discuss this issue with psychologists. 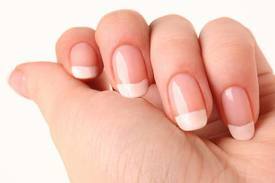 Puffiness around nail fold and reddening mean inflammation of nail-bed. It can be a sign of lupus, skin tuberculosis and other problems with connective tissue. There are ways to prevent yourself from basic disease like fungus by having your own manicure set, which you can use even at salon. And always remember, health it’s the only thing that can’t be bought.